When homeowners entertained back in the 1950’s, most party guests mainly socialized in the living room. Kitchens were not a place for conversation, in fact, they were typically located in the back of the house and had doors to hide the guests from the cooking process. So much has changed since then – today’s guests love to gather in the kitchen, and it’s become the hub for every home, and therefore, a good reason for a modern kitchen renovation. Thanks to the plethora of cooking shows, personal food services, and changes in social behavior, home cooking is now very popular. Kitchens have become the number one remodel for today’s homeowners. Kitchen designs have become more modern with open, airy and comfortable spaces which allow guests to actively participate in food preparation and technology has made functionality impressive. The kitchen is now the best place in your home to gather – your guests and family will gravitate towards the delicious aromas you create in your kitchen. Your kids will do their school projects in the kitchen or scout out after-school snacks in the fridge while you prepare dinner. 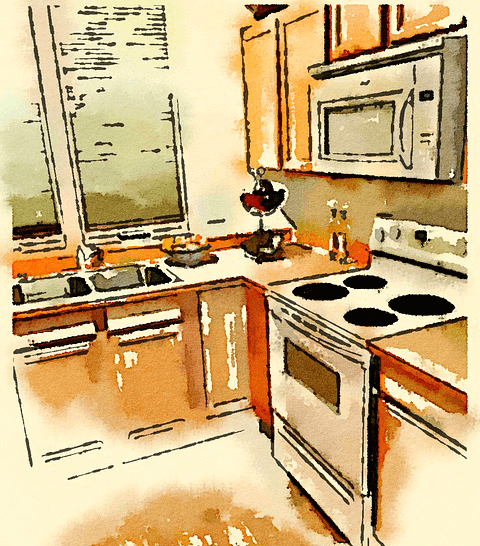 With so much going on in your kitchen, it should be updated or redesigned to accommodate these multiple uses. Even a partial modern kitchen renovation can provide a more efficient and enjoyable space and can ultimately increase your home’s value. Before you redesign your kitchen however, it’s wise to plan ahead so you know what functions, fixtures and features you will implement. When you’re planning to remodel your kitchen, you should consider how the space will be used and that will help determine your floor plan. Features and fixtures should not only be functional, but should match the design choices your make. With the right contractor and high quality products, the space can definitely be customized to reflect your family’s lifestyle. When you’re ready to start your modern kitchen renovation, be sure to speak to our experts about what specialized fixtures and design elements we feature in our showroom.